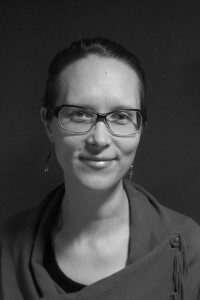 Heini Kiamiri is a scenographer (MA) and a doctoral candidate at Aalto University, Department of Film, Television and Scenography. She has studied Drama Education at the Open University of the University of Jyväskylä, and Clothing Design in Häme University of Applied Sciences, Finland. Heini has worked widely in the fields of theatre, film and television in Finland designing sets and costumes. As a visiting lecturer, she has taught scenography and supervised BA and MA students at Aalto University. During her career, Heini has worked in various productions with and for children and youth, lectured them about scenography and supervised them designing scenography. She is an active member of Assitej Finland and of the Costume in Focus research group. Research Statement: Heini Kiamiri´s artistic research explores young children’s experience of/on scenography and child-oriented ways to design scenography in the field of performing arts for young audiences. Although scholarship in this field has increased in recent years, there is still a limited number of studies analysing young children’s experience of scenographic phenomena. In this practice-based research, Heini investigates how young children perceive, illuminate and treat narrative scenographic phenomena through art-based workshops and artworks with/for children. These workshops use a range of methods familiar to children originating from art education (story crafting, drama play, improvisation and visual art tools). The material created in the workshops then serves as basis for scenographic artworks through which the children’s audience experience is observed. The theoretical background of the research draws from the philosophy of John Dewey, from phenomenology and theories of drama education and applied drama. Heini argues that engaging children in the design process of scenography through collaborative design illuminates concretely to a scenographer how the children’s world of experience can be implemented into a tangible world of performance design. This research contributes to the Costume Methodologies research project by exploring alternative ways to design scenography, stage environment and characters, in collaboration with children.